Nicolas Namoradze is a pianist with a lot to say. And he likes to say it softly. 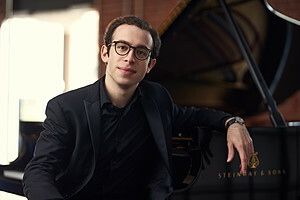 The top-prize winner of the 2018 Honens International Piano Competition in Calgary, Alberta, made an impressive New York recital debut Sunday night at Carnegie’s Zankel Hall with an unconventional program of (in this order) Scriabin, Bach, Schumann, and his own compositions. Like all recital programs, this one offered plenty of opportunities to play loud, and the 26-year-old native of the Republic of Georgia rose to them handsomely, without ever losing his cool demeanor on the piano bench. But the moments that linger long in the memory are the pianissimos. Long stretches of pianissimo, layered, multicolored, deep in thought or swirling like a spring breeze. Pianissimos dense with possibility, and pianissimos that just are. To begin one’s debut recital with two minutes of pianissimo is a statement in itself. Scriabin’s Sonata No. 9 acquired the nickname “Black Mass” for its climaxes of Satanic fire, but Namoradze’s rendering emphasized the dark shadows where menace lurked and flowers of evil bloomed. Eventually, flashes of passion, trills, and torrents of notes emerged, but always against that sensuous background, which enveloped the music again at the close. After a brief pause, the pianist went directly to Bach’s Sinfonia in F minor, a three-part invention whose persistent descending chromatic lines traditionally symbolized death. Namoradze’s playing was appropriately more chaste and transparent than in the Scriabin, yet memories of that piece invested Bach’s daring dissonances with an exotic sensuality. With Bach’s Partita No. 6 in E minor, one had the sensation of emerging at last into the light, and a rather cold light at that. The opening Toccata’s sweeping arpeggios and freewheeling scales seem to invite passionate utterances, but the pianist hewed close to the old meaning of “touch-piece,” coolly demonstrating his skill at articulating voices and shaping phrases, building an imposing piece of Baroque architecture. Namoradze abandoned the pedals entirely during the flexible, richly ornamented Allemande, softening the tone without using the una corda, smoothing and blending the lines without the damper pedal, in an impressive demonstration of what fingers can achieve on their own. Pianissimo and leggierissimo were the watchwords as the sixteenth-notes whirred in the speedy Corrente. Speed and lightness carried over into the sturdy Air that followed. The slow Sarabande quoted the arpeggio phrases from the first movement, but Namoradze again bypassed subjective emotion in favor of bold rhetoric and luxuriant Baroque ornamentation. In the Tempo di Gavotte, the pianist took note of Bach’s distinction between an actual gavotte and a piece “in gavotte tempo,” letting the music flow ahead as no dance would. In contrast, the fugue-style Gigue snapped with jerky rhythms that put a bracing close on this bold interpretation of the partita. Schumann’s Arabeske, Op. 18, opens with a snap too, a little grace-note upbeat, which Namoradze handled at the outset with utmost tenderness, then forcefully in a minor-key episode, and at the close with utter-than-utmost tenderness, as the piece ambled freely and with sensitive phrasing. On the evidence of his performances to that point, one had the feeling that if any pianist could make the case for Schumann’s enigmatic late works, this one could. And in fact, the five movements of the rarely-performed Gesänge der Frühe (Songs of Dawn), Op. 133, offered plenty of contrast in character and texture, with the pianist working more of his pianissimo magic in the expressive opening movement, then turning to sonorous bass octaves with tender figurations in the second. Namoradze responded colorfully to the adventurous harmonies of the third movement, outlining the tune with well-voiced chords in Schumann’s favorite skipping rhythm. Soft, fluid scales descended under an arioso melody in the fourth movement, and a chorale had a river of eighth notes running through it in the fifth. Both movements closed diminuendo to pianissimo—possibly a reason other pianists don’t program this work, but it played very much to the strength of this pianist. Four brief pieces by Namoradze concluded the scheduled program: three etudes and the world premiere of his Arabesque, composed last year. Although a program note by the composer claimed “structural similarities” between his Arabesque and Schumann’s, the piece’s pianistic style was more etude-like than lyrical, referring more literally to “arabesque” as elaborate ornamentation. Overlapping hands produced rippling figures, mostly in the keyboard’s stratospheric register, that moved in and out of each other according to the pianist’s voicing of the lines, a novel and delicious effect. More pure pianistic pleasure was to come in the three etudes, which crackled with wit and astounding technique. (Two of the three ended pianissimo, of course.) In the first, “Major Scales,” scales in parallel and contrary motion raced all over the keyboard, punctuated by sforzando octaves. “Mostly Triads” was the name not of a conservative music festival but of another Namoradze etude where the fast, leggiero scales were made not of single notes but (amazingly) of chords. The title of the last etude, “Moving Mirrors,” described the way syncopated, forte chords reflected each other at the top and bottom of the keyboard, answered by superfast pianissimo fingerwork in the middle. The delighted audience called Namoradze back for encores, and he obliged with four, all of them etudes by Scriabin, including the famous ones in D-sharp minor and C-sharp minor, delivered with the most robust Romantic pianism of the night. Then he took his leave—pianissimo–with the F-sharp major, Op. 42, No. 4.